David Banda of SFHC and Stephanie Enloe of Cornell University recently presented their work on the FARM for Biodiversity project at the Agroecology for the 21st Century Conference in Cape Town, South Africa. You can see their presentation here. Watch the teaser below, produced by film students at the University of Cape Town, to receive a primer on agroecology prepared especially for this exciting event. We’ve added a new page to our site as we launch an ambitious new project, FARMS4Biodiversity. FARMS brings together a team of researchers, farmers, scientists, policy-makers, and many others from around the world. We are so excited to have the opportunity to share our progress with you. 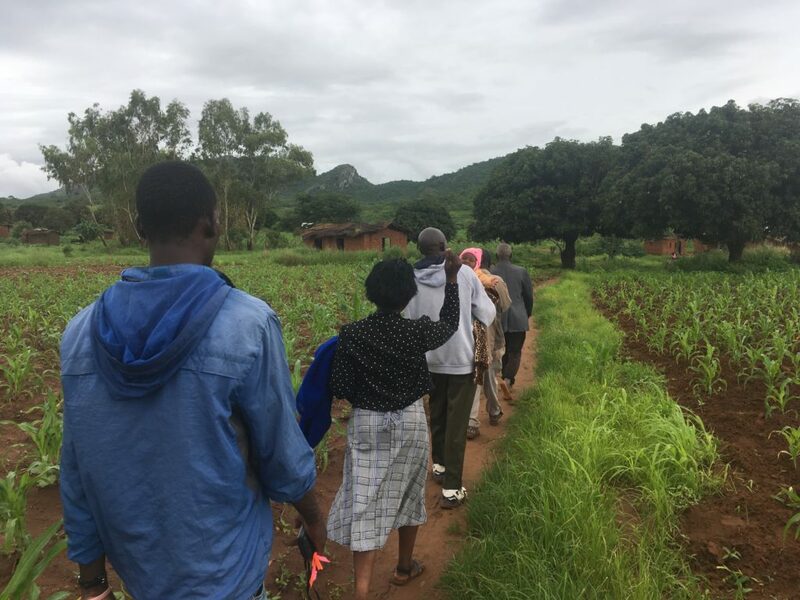 During the week of January 14th, multiple international and Malawian members of the FARMS team met in Malawi to begin work on the new project. Project members worked out a plan for ecological data sampling, in which the team will assess beneficial insects (i.e. bees, parasitoid wasps, and beetle predators) using bowl traps and pitfall traps. 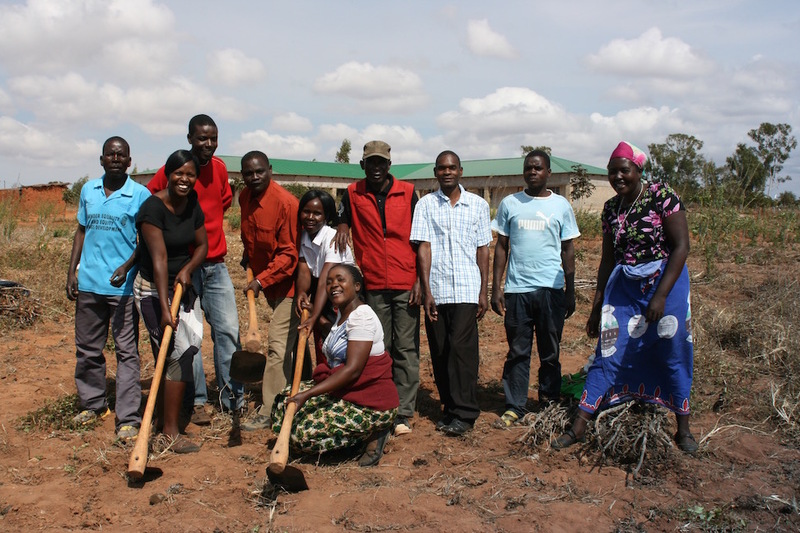 The project coordinator and farmer promoters were trained in using these techniques. Learning to use bowl traps. Learning to use pitfall traps. 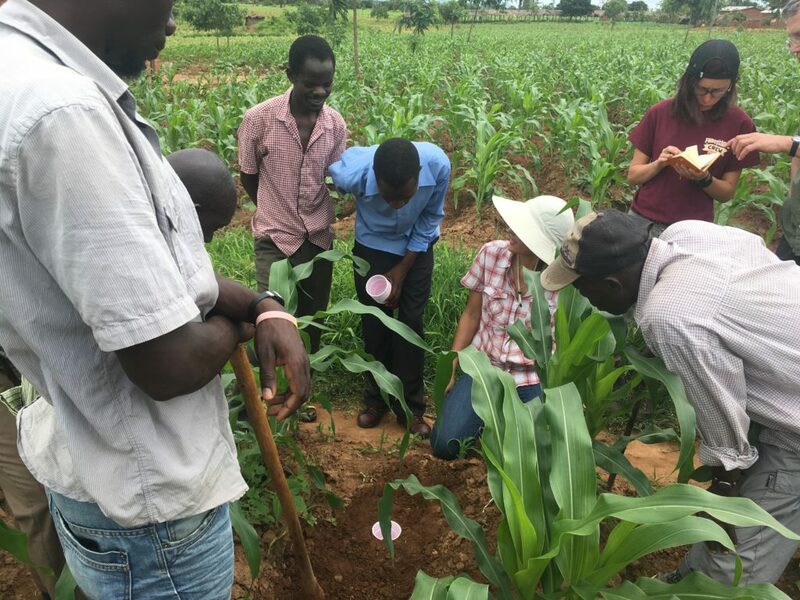 The team will also sample pest damage through visual inspection of maize and bean plants. Team members decided upon the best protocol for collecting these data. Finally, one farmer promotor will conduct bird surveys on participating farms with both visual and acoustic detections. Over the course of two weeks in the latter half of January, the team identified approximately 60 fields in 24 villages where they will perform these collections and surveys. Lots of walking to find farms to include in the study! We look forward to sharing new developments from FARMS as they unfold! 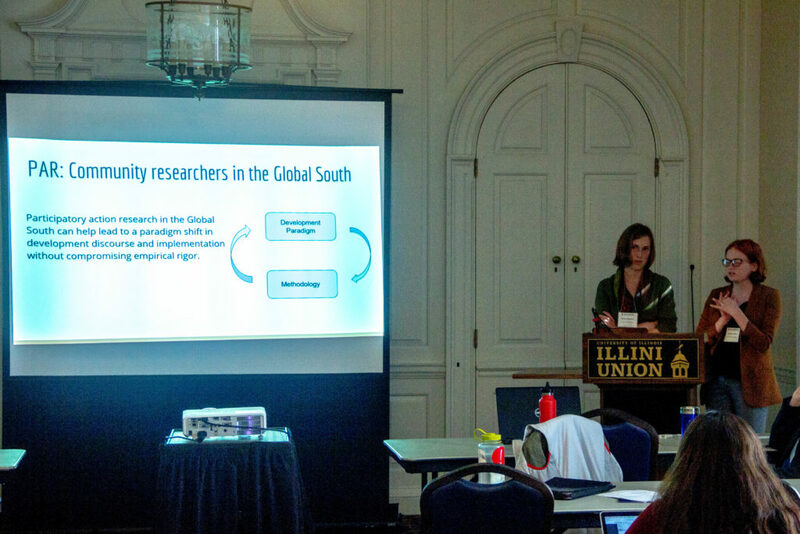 Stephanie Enloe, Rachel Bezner Kerr, Sidney Madsen and Noelle LaDue shared their work with SFHC this October at the 7th Annual Sociology of Development Conference at the University of Illinois at Urbana-Champaign. 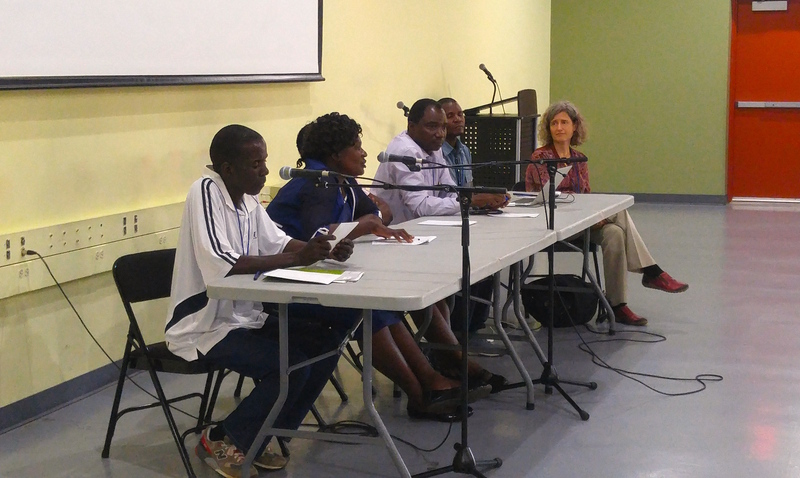 During a section of the conference entitled “Participatory Research for Food Security Among Smallholder Farming Households in Africa and Latin America,” Madsen and LaDue’s presentation covered the co-production of knowledge through semi-structured interviews as part of the Carasso project. Bezner Kerr and Enloe presented their work on agroecological pest management during the same session. Stephanie Madsen and Noelle LaDue give a presentation on participatory action research. The conference’s stated purpose was to explore obstacles to global development from diverse perspectives. To paraphrase a slide from Madsen and LaDue’s presentation, there is room in development work to demystify science, acknowledge the co-production of knowledge, and challenge who can generate scientific knowledge. Participatory research helps balance scientific rigor with accessibility, and ensure that development projects engage with the needs of the community as they articulate them–not solely as they are interpreted by outsiders. New from the Cornell Chronicle, a story about the Ecological Learning Collaboratory we discussed in our previous post. Read the Chronicle article here! The article does a wonderful job providing additional details on the workshop, its goals, and its future. SFHC looks forward to its continued partnership with workshop participants from Tanzania and India, and we are delighted that the gathering attracted interest from both Ritsumeikan University and the University of Gastronomic Sciences in Pollenzo, Italy. We hope that this is the first step in a dialogue across institutions, organizations, and hemispheres. We look forward to keeping you up-to-date in this ongoing experiment in knowledge production and problem-solving. SFHC affiliates and team members (Rachel Bezner Kerr, Hanson Nyantakyi-Frimpong, Laifolo Dakishoni, Esther Lupafya, Lizzie Shumba, Isaac Luginaah and Sieglinde S. Snapp) have just released a new paper on the political ecology of climate change in Renewable Agriculture and Food Systems. 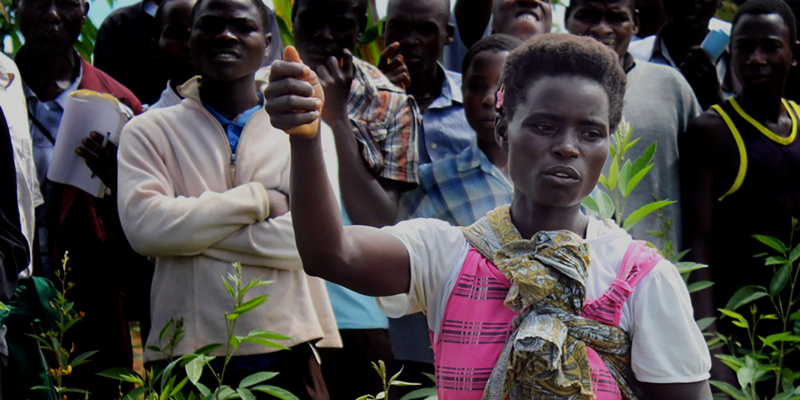 The paper, entitled “Knowledge politics in participatory climate change adaptation research on agroecology in Malawi,” is available online for free reading here. We are pleased to announce some exciting new developments at the SFHC Farmer Research and Training Center! A new pig and poultry enclosure, pictured above, was made possible through funding received from Friends of SFHC. We extend our deepest gratitude to our donors, and invite anyone interested in following the center’s development to check out our construction page here. 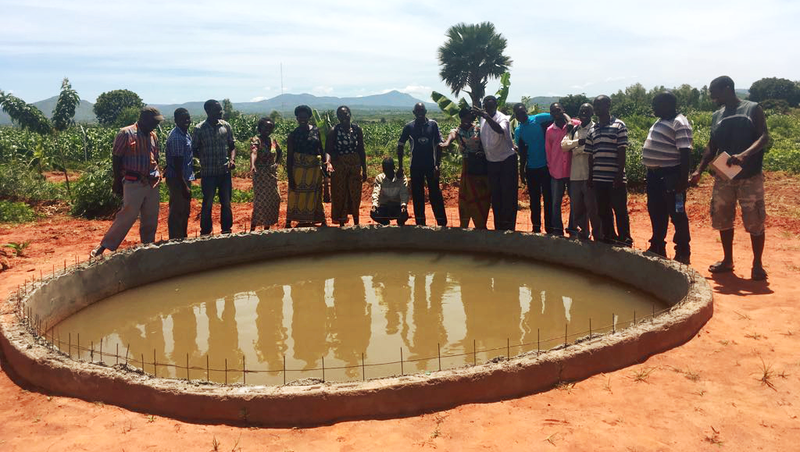 Pictured below, you’ll see we also have a new water tank at the center built by farmers. Once again, a big thank you to our donors for making projects like these possible. If you’re interested in contributing, you can find more information here. We hope to have many more exciting developments to share with you as construction continues. We are pleased to announce that our participatory, integrated curriculum is now available for download for non-profit use! 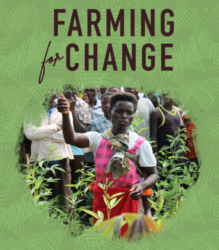 “Farming for Change: A Participatory Teaching Guide on Agroecology, Climate Change, Nutrition and Social Equity” is a training manual written by a team of collaborating farmers, scientists, and staff from development organizations in Malawi and Tanzania. You can read more about the curriculum’s development, goals, and progress here. Before being granted access to the download page, we ask that you complete a short questionnaire telling us why you’re interested in the curriculum. 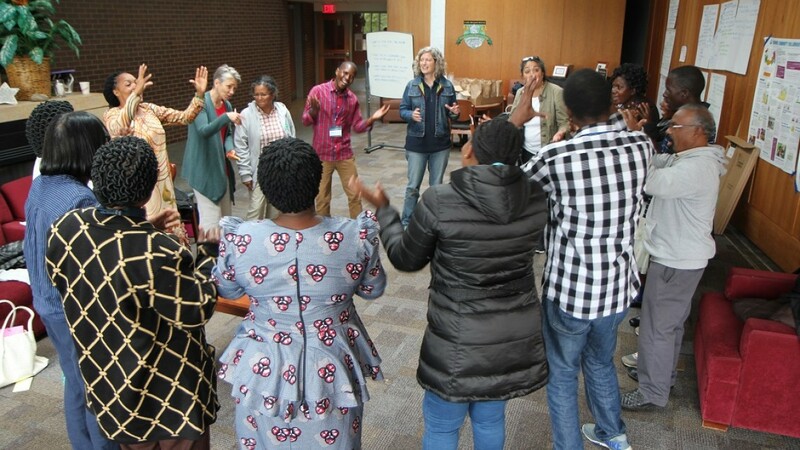 This not only helps us learn about who is using the material and to what end, but it also opens up the opportunity for dialogue between all of us who are interested in participatory, agroecological approaches to building healthy, sustainable communities. 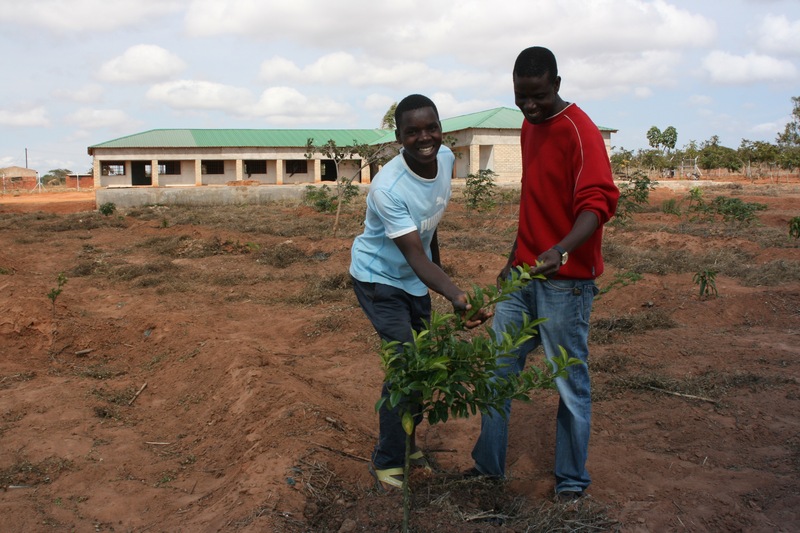 The curriculum is currently available in English, Chichewa, Swahili, and Tumbuka (for non-profit use only). The questionnaire here will lead you to the download page. 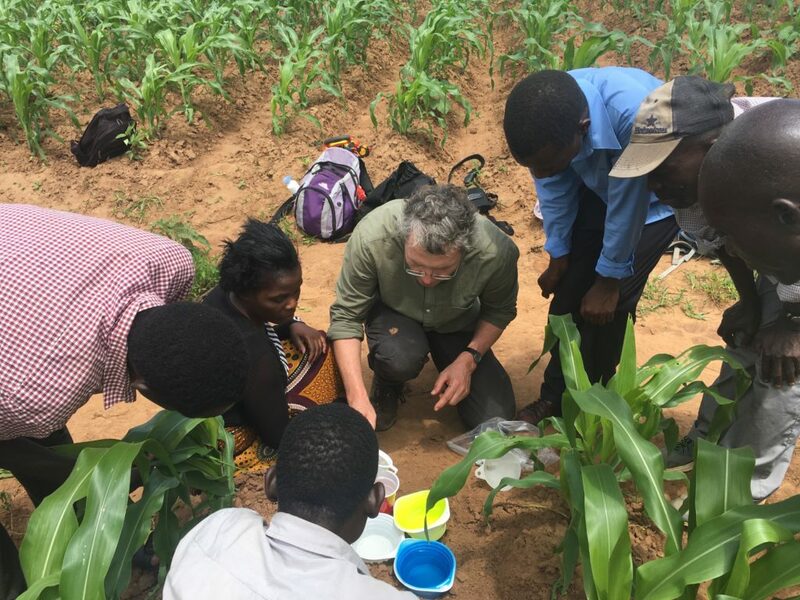 As we’ve announced on our projects page, SFHC is currently taking an important step to expand its work in Malawi–and connect with students, researchers, and collaborators around the world. The SFHC Farmer Research and Training Center, when complete, will serve as the hub for all SFHC activities. Large, open rooms stand ready to seat farmers attending training events. Space is set aside for a soon-to-be constructed kitchen for recipe testing, and more empty rooms will one day serve as offices, seed storage, and more. SFHC also plans to build dormitories for visitors working with SFHC. Visiting the center today, you’re likely to meet Burton Gama and Chance Msangu, pictured to the left in front of the center. Burton and Chance, along with the rest of SFHC’s community promotors, have played a critical role in both the center’s physical construction and the oversight of the example gardens. The gardens demonstrate a great diversity of crops, trees and agroecological techniques. At one end of the property, you’ll find a long row of banana tree collection pits; at the other, the vegetable nursery. Beside the nursery sits the medicinal herb garden and the flower gardens. In the far corner, an excavated pit waits to be filled with water and fish. A huge field of pigeonpea stands tall in its third year. Behind it, many other legume varieties are grown, contributing to the center’s seed bank. 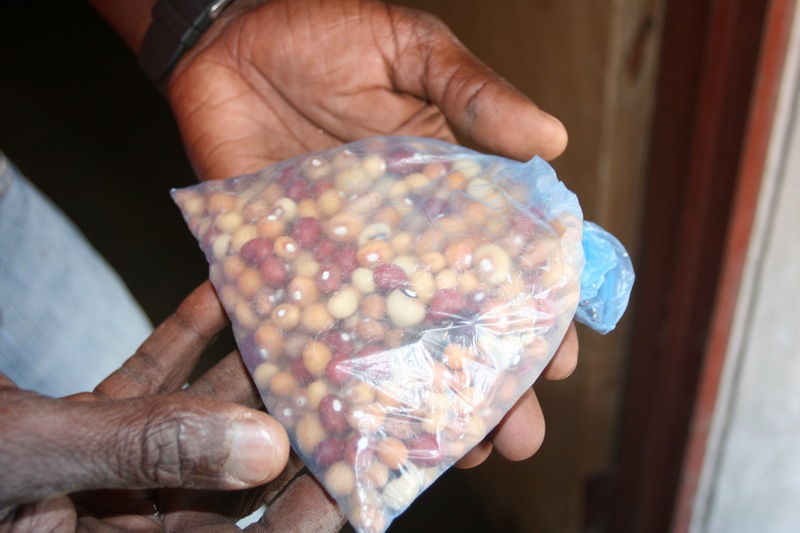 Burton Gama holds a bag of legume seeds from the seed bank. The center’s construction thus far has been made possible through funding from the Government of Canada. However, more funding will be necessary to complete the building. Plumbing, electricity, and other carpentry work will need to be finished, and the cost of training farmers is still outstanding. We’ve laid out all our construction goals here, as well as information about how far a dollar will go toward completing construction. If you’re interested in helping us complete this important project, find out how to donate through Friends of SFHC. 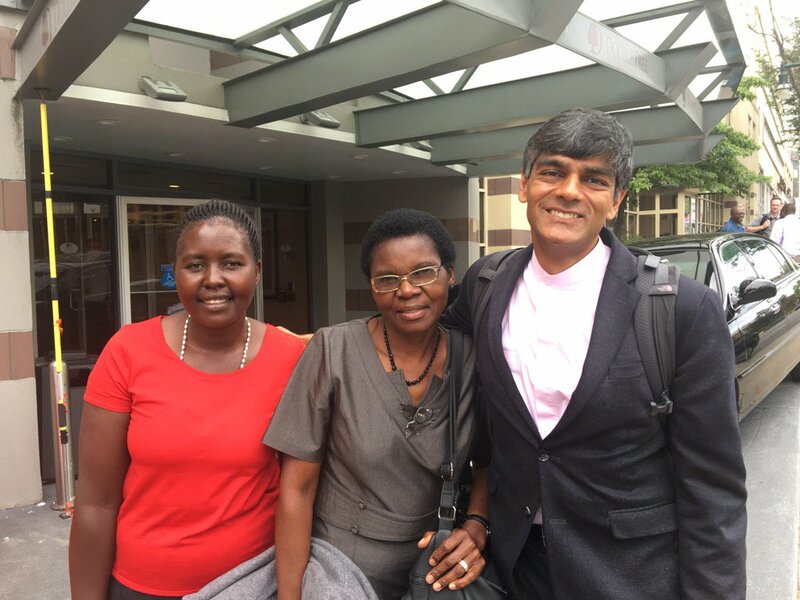 SFHC team members Esther Lupafya and Anita Chitaya have arrived in the United States, marking the beginning of a month-long journey across the nation. Working with Raj Patel and Generation Food, they will make stops to share their experience with food systems, social issues, and climate change consequences–and much more. Their trip will put them in touch with a myriad of audiences, spreading awareness and telling their stories along the way. You can follow Raj Patel on Twitter at @_RajPatel, and read more about Generation Food’s mission to share food system stories from around the globe here.